Abdul Halim Mu'adzam Shah, an avid golfer and Frank Sinatra fan, ascends as the oldest elected monarch in Malaysia. Sultan Abdul Halim Mu'dzan Shah sits as Malaysia's 14th Yang di-Pertuan Agong (or sultan) after being elected to replace Sultan Mizan Zainal Abidin, whose five-year term ended December 12. The election took place October this year. This is the second time that Sultan Abdul Halim was elected as Malaysia's head of state. The 84 year old monarch first assumed the country's highest post in 1970. This is the first time in Malaysian history when a former head of state was elected for the second time. He is also the oldest sultan to ascend the throne. 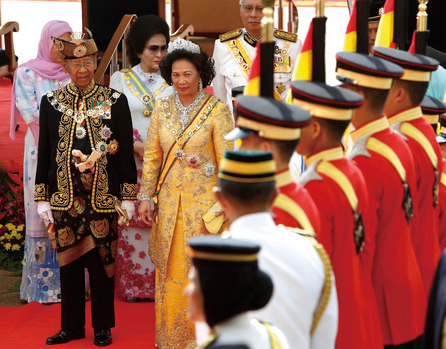 Malaysia has the distinction of being one of the world's few elected monarchy. Every five years, Malaysia's nine sultans gather together to vote for the country's head of state. Abdul Halim, who is an avid football fan and delight with listening to Frank Sinatra, is the ruler of the northern state of Kedah. 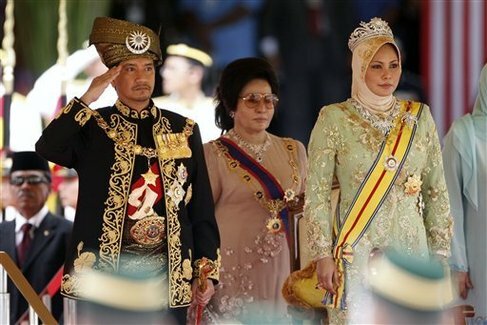 The newly proclaimed sultan, together with his wife Queen Haminah, attended his enthronement December 13, which was followed by an inspection of the military honor guards and by a 21-gun salute at Parliament. The event was followed by the oath taking ceremony. 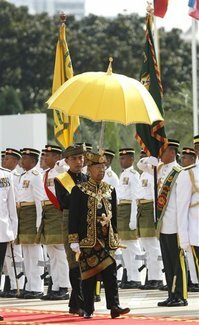 The King of Malaysia is mainly a ceremonial position. He heads the country but he doesn't govern, that job rests on the prime minister and his cabinet. 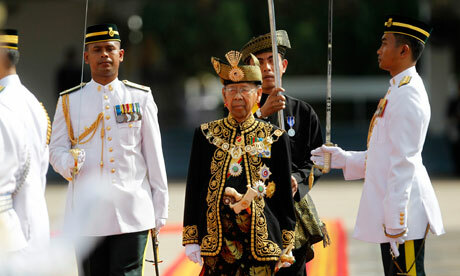 However, the king is looked upon as symbol of Islam in Malaysia and revered as the upholder of Malaysian traditions. 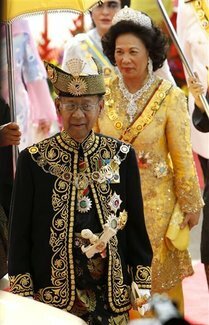 The term Yang di-Pertuan Agong means “He who is made Lord,” although it is more popular known as “Supreme Ruler”. King Abdul Halim was born on November 28, 1927 at Istana Anak Bukit near Alor Star, the second and oldest surviving son of Sultan Badlishah (b. 1894; r. 1943-58), who later succeeded as the 27th Sultan of Kedah, and Tunku Sofiah binti Tunku Mahmud (1910-35), who died of vehicle accident. He studied at Alor Merah and Titi Gajah and attended Sultan Abdul Hamid College. He obtained a Diploma in Social Science and Public Administration at Wadham College in Oxford and served with the Alor Star District Office and as state treasurer before joining the Kedah Administrative District. He became heir apparent (Rajah Muda) in 1949 and succeeded as the 28th Sultan of Kedah on his father's death, July 15, 1958. His ceremonial enthronment took place February 20, 1949 at the Balai Selar in Alor Star. He was elected deputy prime minister in 1965 before assuming as the fifth Yang di-Pertuan Agong of Malaysia, Sept. 21, 1970 and served with full capacity until Sept. 1985. The most notable event during his first term as Malaysia's Supreme Ruler was the resignation of his uncle Tunku Abdul Rahman as prime minister, in favor of his deputy Tun Abdul Razak. Rahman felt it unfit for an uncle to serve as his nephew's prime minister, given the strict royal protocol observed in Malaysia. Prior to his second election as king in Oct. 2011, he was elected deputy elected deputy prime minister in 2006. The king is married to Tuangku Bahiyah (1930-2003), daughter of Tunku Abdul Rahman of Negeri Simbilan, in 1956. They have three daughters. In 1975, he married his second wife, Cik Haminah binti Hamidun, a commoner. She assumed the title of Sultanah upon the death of Tuangku. Sultan Abdul Halim celebrated his golden jubilee as Sultan of Kedah. So far, he is one of the only four sultans of Kedah to reach their 50th year on the throne. The King and Queen during the welcoming ceremony in Parliament. The King during the welcoming ceremony in Parliament Square. The King inspects the honor guards. the dais after the opening ceremony. stands beside him during his official farewell ceremony at Parliament Square. 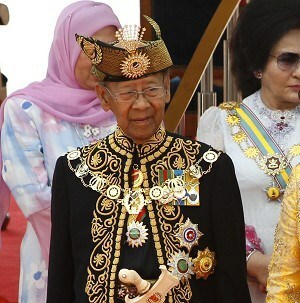 http://www.ledger-enquirer.com/2011/12/12/1855899/84-year-old-sultan-becomes-malaysias.html, retrieved December 19, 2011. Prince Philip: Let Me Go Home!